The current trend among many Major League hitters is to sell out for power, to sacrifice batting average to high strikeout totals and higher slugging percentages. Not every player in the Minors, however, is following along with that trend. 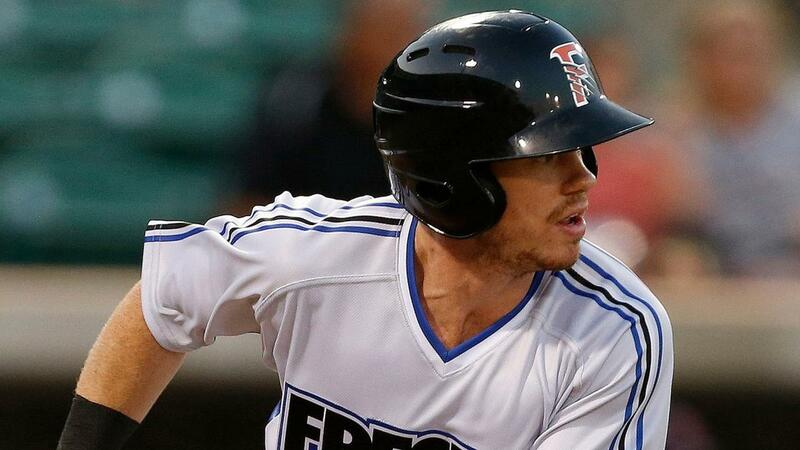 Outfielder Drew Ferguson is the rare example of the high average/on-base percentage player still plying his trade at Triple-A. "I've made a conscious effort to be that player," said Ferguson, the Astros' No. 16 prospect. "Because in the past I get carried away with trying to hit home runs. I've done that in my career. "I realized power is something that's really, really, really hard to develop," he said. "If you don't hit the ball extraordinarily hard just naturally with your natural swing, it's really hard to make it appear out of nowhere. I don't hit the ball particularly hard so I'm playing into my strengths to some extent." Ferguson has hit .300/.436/.400 this season, drawing 41 walks to offset his 53 strikeouts in 200 at-bats with the Fresno Grizzlies. "My focus this year is to be an on-base machine, hit a lot of line drives," he said. "That's exactly what I'm trying to do." Ferguson has not shown much power this season, with just eight doubles, three triples and two home runs. He would still like to hit for a little more power, but not at the expense of what's made him successful overall. "I hit for a pretty high [average], but I'm really just trying to leverage my skill set to be the most productive offensive player," Ferguson said. "I'm a pretty analytical guy, and I know one of the most valuable things in baseball is not getting out. Guys get carried away, wrapped up in batting average, RBIs and home runs. "That's great to have all of those things be super high, but at the end of the day you want your team to score the most runs. I feel with what I can do and what I'm trying to do, that's the best way to make that happen, to add as many runs as I can." While the Astros are coming off their first World Series championship last season, Ferguson said he and the other players in the farm system remain optimistic that they will get a chance some day if they perform to the best of their abilities. "You have to love that," he said. "Not to talk negatively about other organizations, but there are some that don't develop their guys well. They don't give young players opportunities. I think more and more organizations, it's a copycat industry, so they're going to take the Astros' mold for success." Road warrior: Albuquerque has long been known as a hitter's haven, but one infielder is having more success away from Isotopes Park. Rockies No. 6 prospect Garrett Hampson is batting .357/.449/.548 on the road compared to just .262/.385/.357 at a mile above sea level. Late start: Dodgers No. 11 prospect Edwin Rios did not join the lineup at Oklahoma City until May 25, but he has worked fast to make up for lost time. The corner infielder has hit .319/.373/.468 in 12 games. Express rebound: Rangers No. 30 prospect Andy Ibanez has bounced back after a disappointing Double-A campaign in 2017. After hitting .265/.323/.400 with eight home runs at Frisco, the infielder has hit .321/.394/.455 with five home runs with Round Rock.